Agilent Technologies introduces the N7100 signal intelligence (SIGINT) search, collection and direction-finding system designed for quick-reaction deployment. The N7100 is a highly adaptable, multi-mission measurement platform that allows users to capture and locate challenging signals in difficult radio frequency (RF) environments. Key advantages of the N7100 signal detection system include its modularity, compact size and raw measurement speed. The N7100’s speed enables new capabilities such as ultra-fast wideband search, fully integrated wideband direction-finding (DF) and sustained multiband signal collection. Other capabilities include RF surveys, signal monitoring as well as wideband signal recording and playback to rack-mount disk arrays. The N7100 signal intelligence system supports Agilent E3238S signal search and collection software for maximum productivity. The N7100 also supports the Agilent universal signal detection software, which recognises more than 20 types of modulation and lets system users create new signal detectors during ongoing operations without programming. 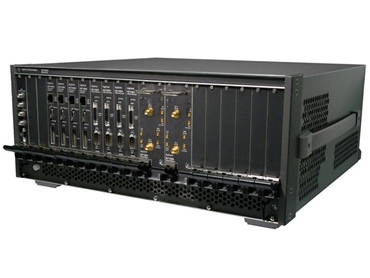 The N7100 signal intelligence system meets modular open-system architecture (MOSA) requirements through commercial, off-the-shelf (COTS) hardware built on industry standards such as Compact PCI, PCI Express(r) and PXI Express.